Posted on June 11, 2013 by Anna C.
Welcome to the final installment of our series chronicling the history of the birth control pill. In earlier installments, we learned how chemists were able to extract a chemical from a wild yam called barbasco and convert it into progesterone, the active ingredient in the Pill. In 1960, the FDA approved oral contraceptives for marketing. At this time, more than 2 million Americans were already using the Pill — and more than 100,000 Mexican campesinos (a Spanish word for peasants) were harvesting barbasco, the wild yam necessary for its production. By 1974, 125,000 Mexicans were collecting and selling barbasco. Every week, during the barbasco trade’s peak, an excess of 10 tons of the plant were removed from tropical Mexico. Until the barbasco supply started to dwindle in the 1970s, Mexico enjoyed prominence as the world’s supplier of progesterone. Though they were paid subsistence-level wages for their labors (half a peso per kilo of dried root), and the work itself was dangerous and backbreaking, they were putting Mexico on the map in the scientific community. After establishing a hormone synthesis industry in Mexico, the European stranglehold on hormones was loosened and the price of progesterone plummeted from $80 per gram to less than a dollar per gram. By 1954, Syntex, a Mexican laboratory, was the largest producer of steroids in the world, having usurped Europe’s monopoly. Eduardo Domínguez of Amatepec explained that his dry region yielded a poor quality barbasco, and hence he and his neighbors were paid less than most barbasequeros. After observing the process and independently experimenting they discovered that they could manipulate the percentage yield of diosgenin content by adding what Domínguez shrewdly described as “something.” Laboratory representatives were astounded when a purer diosgenin content began to emerge from the Amatepec beneficios. These campesinos were experimenting with basic steroid hormones. The processing of barbasco involved being fermented, dried, bundled up, and delivered to Syntex in Mexico City. After being gathered, it had to be delivered to a collection site as soon as possible, since it starts to rot and shrivel within hours of harvest, affecting its value as it was sold by the kilogram. The barbasco trade was confined to Mexico because the wild yam was never successfully transplanted in the United States, and even when it could be grown in other places, such as Guatemala and Puerto Rico, the concentration of the desired chemicals was significantly lower when compared with plants in their native range. Until 1975 more than 2,000 tons of barbasco were processed annually, all in Mexico. The country dominated the global steroid industry, but this situation could not remain tenable. 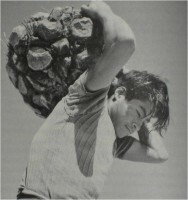 In the 1970s, public consciousness was raised about the exploitation of the campesinos’ labor, and in 1975, Mexican President Luis Echeverría created Proquivemex, a regulatory body that, among other things, increased wages for the barbasco gatherers. At the same time, the barbasco supply was dwindling. Reportedly, barbasco had become extinct in some areas by 1976 or 1977 due to overharvesting. This led to massive price increases, which in turn spurred pharmaceutical companies to search for alternative raw materials. The Mexican steroid industry was also suffering as pharmaceutical companies were finding ways to reduce dosages, while other scientists were experimenting with plants like soy, from which molecularly similar compounds could be derived. In fact, decades earlier a scientist named Percy Lavon Julian had figured out an effective method for deriving progesterone from soybean oil. In response to price hikes, pharmaceutical companies investigated ways to use microbes to convert soybean-derived steroids, sitosterol and stigmasterol, into progesterone. Unable to find a microorganism that could perform the necessary chemical conversions, researchers induced mutations in microbes using ultraviolet light or mutagenic chemicals. In a typical experiment, a microorganism was exposed to a mutagen and then placed into a medium with cholesterol and a hormone such as testosterone. Researchers would hope for growth on the cholesterol but not on the hormone — indicating that the organisms could digest the relevant parts of the cholesterol, but would not further degrade the cholesterols once their structure had been broken down into that of a hormone. By the end of the 1970s, barbasco was obsolete. Methods for converting cheap and abundant starting materials using microbes were developed, and the Mexican steroid industry relinquished its dominance. Soybean byproducts replaced barbasco as the starting material for progesterone and other steroids, which hammered the nail into the Mexican steroid industry’s coffin. Barbasco still grows in Mexico’s jungles, and university-level science education in Mexico owes a debt to the boost it was given when the country enjoyed its prominence as the world’s supplier of progesterone. Thanks for reading our series on the history of the birth control pill. We hope you will agree that the Pill’s history tells an inspiring story of human inquiry and the triumph of scientific investigation, which had a positive impact on our society as a whole and the individuals within it. This entry was posted in Birth Control, History and tagged barbasco, barbasequeros, birth control, birth control pill, campesino, campesinos, contraception, contraceptives, History of the Birth Control Pill, hormonal contraception, hormonal contraceptives, hormones, Luis Echeverría, Mexico, microbes, microbial synthesis, microorganisms, peasants, Proquivemex, sitosterol, soy, soybean oil, stigmasterol, the Pill, wild yam, yam, yams by Anna C.. Bookmark the permalink. Let's Talk Contraception: What's the Difference Between Generic and Brand-Name Birth Control?